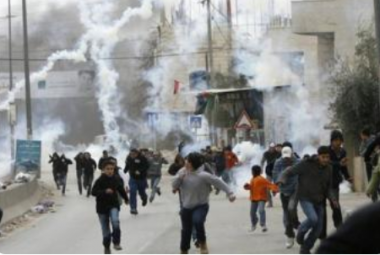 Israeli soldiers injured, Sunday, two Palestinians and caused dozens to suffer the effects of teargas inhalation, after the army attacked a nonviolent procession near Huwwara military roadblock, south of Nablus, in northern West Bank. The soldiers fired live rounds, rubber-coated steel bullets, gas bombs and concussion grenades at the protesters as they marched towards the roadblock. Media sources said two Palestinians were injured, and dozens suffered the effects of teargas inhalation, before receiving treatment by local medics. The nonviolent protest was attended by members of various political factions of the Palestine Liberation Organization (PLO), and many social figures. It was held in condemnation of the escalating Israeli violations against the Palestinians in occupied Jerusalem, including the abduction and imprisonment of many figures. Fateh Secretary in Nablus Jihad Ramadan, said the Palestinian message to the entire world is that Jerusalem is the core, the heart and the capital of Palestine. He added that Israel’s escalating violations against the Palestinians, their homes and lands in the city, target the existence of the indigenous Palestinian population in the city.